Zounds! Reworks and a new powerful character are both on the horizon in Star Wars Galaxy of Heroes! Our New Hope! Commander Luke Skywalker! The newest character to hit Galaxy of Heroes will be Commander Luke Skywalker. Commander Luke will be released through the upcoming Hero’s Journey event and will arrive with a very powerful kit. Commander Luke will be the first character in the game to have six different abilities, and three of those abilities will include Zetas. Commander Luke will be able to Dispel, apply Debuffs, Counter, and allow others to counter and gain turn meter as well. Expect that all five characters will need to be Level 85 and at high gear (G9+) in order to unlock Commander Luke Skywalker. With the arrival of Commander Luke Skywalker, several Rebel characters will be seeing new reworks, with updated stats and abilities. Packs and bundles are returning to the cantina, allowing players to gear and level up characters in preparation for the return of R2-D2 and the arrival of Commander Luke. Mod Packs are back in the store for a limited time and could be a great way to gain some specific mod sets or shapes in one place. Mod Packs will be 999 crystals a set and will include seven total 4 or 5 S* Mods, one for each slot and also a bonus Gold 5* from any slot. Mod Packs are available for each of the 8 Mod Sets and can be purchased up to 5 times per day. Be sure to check out Should I Buy a Mod Set Pack for more details on Mod Packs. The Empire Faction Pack gives an opportunity to pull from a specific set of empire characters to promote their stars quickly using crystals. Each pack will offer anywhere from 10 to 330 shards, which could be enough for a 7* character for those players in a pinch. The pack will cost 699 crystals and are available to purchase up to 10 times. Possible characters include Death Trooper, Director Krennic, Gar Saxon, General Veers, Grand Moff Tarkin, Imperial Super Commando, Magmatrooper, Royal Guard, Shoretrooper, Snowtrooper, Stormtrooper, and TIE Fighter Pilot. To see more details on the probability of pulling the desired shards and their amount, take a look at our Should I Buy the Empire Faction Pack article. The Power Up Bundle offers a set amount of shards, credits, and gear, offering players a chance to know precisely what they are getting and a way to focus levelling and promoting. 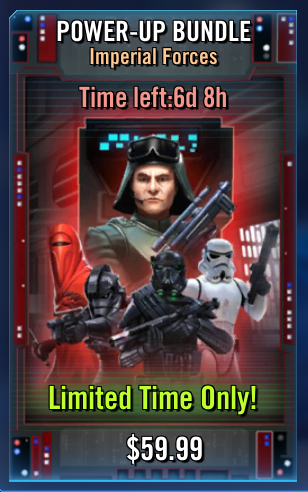 The Power Up Bundle includes 80 shards each for General Veers, Death Trooper, and Stormtrooper and 25 shards each for TIE Fighter Pilot and Royal Guard. 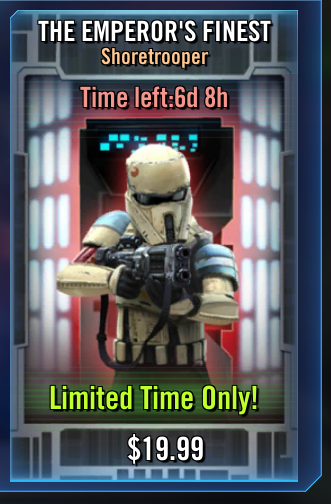 The bundle also comes with various gear and 1.25 M credits. The bundle is available as a one-time purchase for $59.99 USD. Separate from the Power Up Bundle, the Emperor’s Finest bundles are available for several individual characters, allowing players to buy only the shards and gear specific to the desired character. Speculation Ahead! With the return of R2-D2’s Daring Droid event and with multiple Rebel character reworks pending, we expect to see new characters appear in the Shard Shop, including Obi-Wan Kenobi (Old Ben), Princess Leia, Stormtrooper Han, and Luke Skywalker (Farmboy). We also expect to see some new character packs and bundles, all to help us prepare for the powerful new Commander Luke Skywalker. Also, don’t forget that Territory Battles have been teased by the developers, so we also expect to see the new raid appear within the coming weeks. Be the first to comment on "SWGoH Community News – August 5, 2017"